Students examine human impacts on the environment at both a local and regional level. A variety of map work and photograph analysis is undertaken using topographic maps, satellite photos, aerial photos and stereoscopes. The introduction and impacts of introduced species will be investigated along a transect line. Creek water quality will be evaluated by testing turbidity, water pH, water phosphate levels and catching water animals to use as indicator species. Soil testing will be conducted using a centrifuge and linked to a discussion about erosion and land clearing. The impact of fire on the bush will also be investigated. Students investigate aspects of the coastal biophysical environment and examine the ways in which humans impact on and are affected by natural coastal processes. 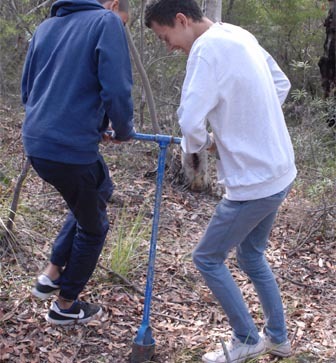 Students investigate aspects of the wetland biophysical environment and examine the ways in which humans impact on and are affected by natural tidal processes. Students discuss and measure the functioning of the biosphere, lithosphere, hydrosphere and atmosphere within the wetlands ecosystem. Field work includes studying interactions between lithosphere and biosphere by conducting a vegetation survey through different ecosystems, determining how the biosphere has adapted to hydrospheric processes by studying a mangrove tree in detail. Land use in the area will be investigated with particular emphasis on the related impacts on the spheres, management strategies and future proposals.